**New 2019 Model** The LifeSpan Fitness TR5500i Folding Treadmill is a top-of-the-line heavy duty treadmill. This model has everything that a serious runner will need (powerful motor + long running deck). The Lifespan TR5500i features an extra powerful 4.0 horsepower (hp) motor (continuous duty) , which can reach speeds up to 13.5 miles per hour (in increments of 0.5 mph). This brand new model has a 10-inch LCD touchscreen with over 50 workout programs. The built-in heart monitor program, allows you keep your heart rate constant as the treadmill adjusts the speed and incline for you. The treadmill has 13 levels of incline and 2 levels of Decline. Treadmills with Decline grade will simulate running downhill which is a rare feature, and it builds up different muscles than incline does. The longer and wider deck is an extra large 22″ x 60″ area and is ideal for walking, jogging or running, and ideal for taller users. Ideal for toning up, managing your weight, and improving your cardiovascular health. A biomechanically sound deck suspension system supports people up to 350 pounds in weight. 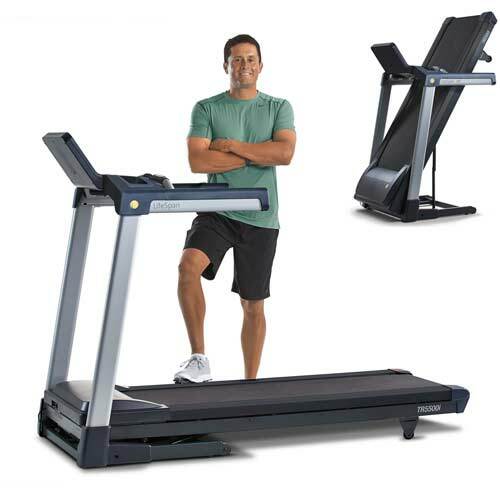 The treadmill includes a folding frame with an automatic EZ Drop system. Intelli-Step step-counting feature that works like a pedometer. Built-in Bluetooth wireless technology allows you to use an APP on your Smartphone to monitor your progress. Use the Lifespan APP, Apple Health & Google Fit. LifeSpan TR5500i Treadmill Features: The LifeSpan Fitness TR5500i features include a 10-inch full-color touchscreen with 3 dashboard views (graph view, gauge view and track view). Keeps track of time, calories, distance, heart rate, steps, speed, and incline. Pulse grip heart rate monitoring, heart telemetry, and over 50 workout programs. Includes 5 Quickset™ speed and 5 Quickset™ incline buttons. Cool off with the 3 speed workout fan. Safety: Intelli-Guard, a patented LifeSpan feature, automatically pauses belt movement 20 seconds after you step away from the treadmill deck. 2019 Upgrade Features: The new model has increased motor power to 4.0 HP, widened the running deck to 22 inches (from 20), added a 10-inch color Touchscreen, upgraded to 50 workout programs (up from 23), added heart telemetry, and Bluetooth to connect to the Lifespan APP. Maximum User Weight Capacity: Up to 350 pounds. Safety Features: Red emergency stop button, a tether stops the treadmill when the tether key pops out. TR5500iTreadmill Warranty: Frame – Lifetime; Motor – Lifetime; Parts – 5 years; Labor – 2 years. Smart-Review Commentary: The new 2019 LifeSpan Fitness TR5500i Running Treadmill is Lifespan’s best and most powerful home treadmill. Two key factor for runners and taller users include a powerful 4.0 horsepower motor and a wide and long running deck. Powerful motors are important because straining motors will burn out faster. This model can support up to a 350 lb. user, and speeds up to 13.5 mph. The TR5500i has an EZ Drop system which makes it easy to fold up when not in use. With a long and wide 22 x 60″ running area, it is ideal for walking, running, or jogging, and taller runners. The Deck is 1-inch thick, supported by 8 shock absorbers for minimal impact on your joints. You can set the treadmill to keep your heart rate constant (treadmill will adjust to keep it in the zone). The new console has a 10-inch LCD Touchscreen that is clear and easy to read, Lifespan has also added over 27 more workout programs (50 total). The built in speakers allow you to plug in your Smartphone or mp3 player and listen to music as you exercise. You can watch your progress on the Lifespan APP which connects to the treadmill by Bluetooth. A rare feature on this treadmill is 2 levels of decline, which simulates running downhill and develops different sets of muscles. 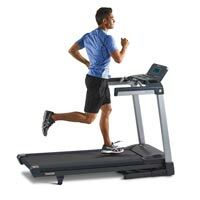 The TR5500i has many safety features built-in to turn off the treadmill. 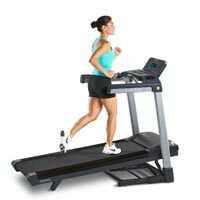 Reviewers report that this treadmill runs quiet and smooth with a solid running deck. We have found that overall the LifeSpan Fitness brand of treadmills have received outstanding reviews. This model gets the Smart-Review BEST of 2019 Award for running treadmills. Maximum user weight limit: 350 lbs.